Enova Insider: Future Leaders Series - Enova International, Inc. In the beginning of the year, we said: We want 2015 to be different. We’d like it to be more…development focused and robust with opportunities… more promising of positive changes…more spectacular! So what did we come up with at Enova? The Future Leaders Series. By now, (if you’re an Enova associate) you might have heard about it. 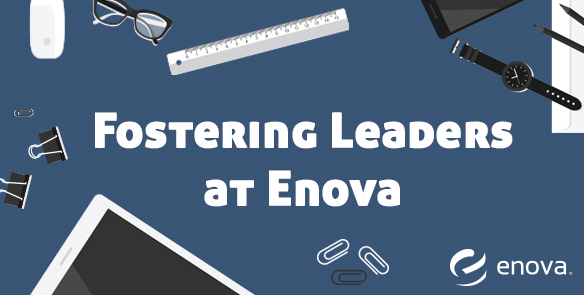 For those that haven’t yet, here’s what it’s all about: The Future Leaders Series is a new program initiative that focuses on providing Enova employees with an array of resources and developmental opportunities from training workshops to one-on-one career coaching. How are these training topics determined? In short, by our employees! We designed the program around topics of interest that we gathered from the organization. Hence, each quarter we roll out a new theme. 2015 began with a focus on communication and collaboration, and by mid-year we found ourselves in the realm of project management. As we are now rounding off the third quarter, we are getting excited about the end of the year. What do we have in store for Enova employees? Leadership and influence! Cool, right? So let’s connect! For our employees, please check out our Wiki to learn more and keep an eye out for future announcements. Also, don’t forget sign up for one of our awesome workshops! Do you have any other things we can help out with? Stop by! It’s what we do!